Juna Rai, appears for a rendezvous at Kapan in a grey sweatshirt and military haircut, looking much more petite than expected. It is impossible to tell she is the Comrade Chunauti of photojournalist Sagar Shrestha’s famous image (pic, below) of the Nepal conflict. 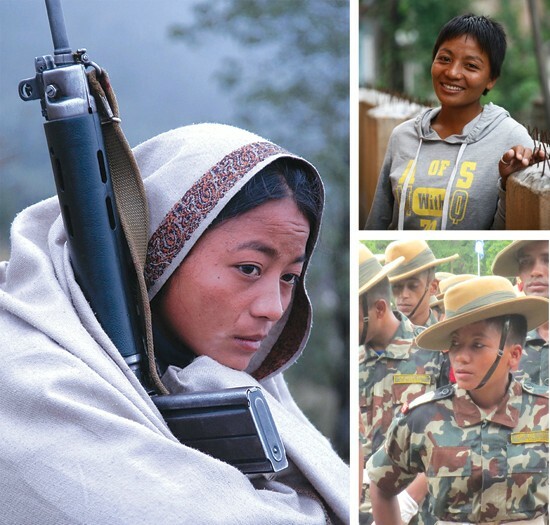 Shrestha took the picture in Bhojpur in 2006 as Rai was on sentry duty at a Maoist base, huddled against the cold and keeping her SLR assault rifle warm. 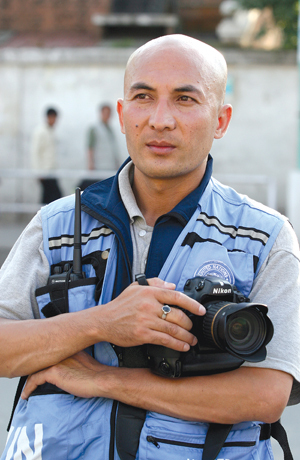 The photograph was included in Kunda Dixit’s book, A People War, published by nepa~laya in 2006. Juna Rai’s iconic picture has gone around the world, toured the country as part of a travelling photo exhibition seen by 500,000 people, and has been used in movie posters and lately even in Kathmandu’s new street murals. It was only when Dixit’s sequel, People After War, came out in 2009 did it become known that Juna’s brother, Bhuwan, was in the Royal Nepal Army. The siblings actually took part in the battle of Bhojpur and Diktel on opposite sides, and could have ended up killing each other. Nepal’s conflict wasn’t just a civil war, it was a sibling war. After languishing four years in the Udaypur cantonment, Juna was among 1,422 former guerrillas inducted into the Nepal Army last month. She has lost her long tresses, and is proud to call herself a ‘soldier’ now in the same army as her brother. “There are no words to describe how happy I was during the passing-out parade in Trisuli,” says Juna, showing us pictures of the ceremony. Inspired by her family’s martial tradition (her grandfather was in the British Army and uncle in the Indian Army) Juna always fancied herself in uniform. As a lance corporal in the Nepal Army, she is now undergoing a bridge course to receive her insignia and was in Kathmandu this week for a short break. “It is difficult to believe that life still turned out good after all those years, and I am glad the bloodshed is over,” she says, looking pensive. Juna decided to join the Maoists in 2003 after hearing a rousing speech by a Maoist recruiter in Khotang who promised equality and a society free of discrimination and exploitation. She was in Grade 8, and didn’t even tell her father when she left home with some friends. She was nearly killed by an exploding grenade during the battle for Bhojpur in 2004 in which her commander and 20 others were killed. A deep leg injury still reminds her of that battle. Four years ago, speaking to this paper, Juna was optimistic about joining her brother Bhuwan in the same army. “Luckily we didn’t encounter each other, or else we may have killed each other,” she said. During the conflict Juna and Bhuwan prayed for each others’ safety even though they were on opposing sides. Juna is now 27 and married to Kumar Tamang who was also a guerrilla who took voluntary retirement because of injuries. Their seven-year-old son Sachin lives with Juna’s sister Guna in Sunsari. Having lost her own mother when she was two, Juna talks to her son every day. “I hope he will understand that I am in the army only to ensure a better future for him,” she says. Juna has no regrets about joining the Maoist army, and believes she was fighting for justice and equality. “The changes we fought for will take time, but at least we prepared the ground for it,” Juna says. She admits there were misgivings among her comrades about joining what they were trained to regard as an enemy force, but everything went smoothly. Juna Rai looks back at her life from a teenage guerrilla to the young soldier and mother that she has now become. “It only seemed like yesterday when Sagar Dai took that picture,” she recalls. It was 2006, and Sagar Shrestha (above) saw Juna on lonely sentry duty on a foggy morning in Daburang Bhanjyang of Bhojpur, guarding a Maoist base. He took the picture with his Nikon SLR, but never expected it would become so famous. Juna’s war weary demeanour came to symbolise battle fatigue among fighters, and the role of women in the Maoist army. “She was looking on as her comrades took part in morning drill,” recounts Sagar, who submitted his photograph for the book, A People War and also to Associated Press.